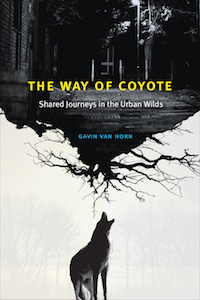 In his “Prologue” to The Way of Coyote, Gavin Van Horn, Director of Cultures of Conservation at the Center for Humans and Nature, leaves no doubt as to what his book is about. Before coming to Chicago, his “Plan A” was to inhabit a cabin with his family far from an urban area. But he found himself in a decidedly urban environment. Following this promise, he begins the book with a deceptively beguiling tale featuring the character Coyote playing dice with his friends Badger and Wolf. 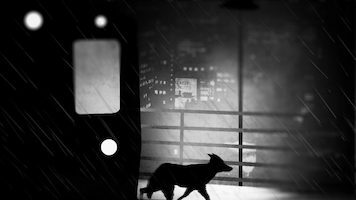 The game ends abruptly when the dice encounter a concrete roadway that Wolf and Badger fear walking on. But Coyote, the great adapter and trickster, jumps playfully onto the surface, gathers up the dice, and coolly walks away. The tale is deceptive, like the coyote, because this story resembling a bedtime story for adults is Van Horn’s way of introducing the reader to his admirably adaptive central character. The story also sets the style of the book, a delightful lyrical prose that beckons the reader to follow along with Van Horn on his personal journey, accompanied by non-human animals and even insects. The journey takes the reader into the wilds of one of this country’s most populous cities into which non-human beings are beginning to feel less and less threatened by or threatening to greater numbers of humans. Van Horn invites the reader to walk with him throughout Chicago’s many pathways and to ply with him its waterways. The city “bleeds out” into majestic Lake Michigan to the east and into flatlands to the south and west beyond its suburban communities. Two hundred years ago, Van Horn reminds us, this was wilderness where non-human animals thrived. Their abundance brought the hunter and the pioneer who slowly diminished their numbers and their habitats by building their own city, thus making subservient the water and land to their own use and convenience. Even so, through the insight of a few city planners and architects such as Daniel Burnham, large swatches of natural land were preserved and a long process of non-human animal inhabitation has followed. Now, as Van Horn suggests throughout this book, a multitude of non-human beings is once again inhabiting this city and other urban areas throughout the country. The coyote is no longer simply an evanescent being unlikely to be encountered by a city dweller. The urban adapter now walks pathways within neighborhoods, created by prescient city planners who know the value of balance within the natural world. Van Horn’s journey leads him eventually to a meditation on Aldo Leopold’s “land ethic,” which Leopold defines in this way: “A thing is right when it tends to preserve the integrity, stability, and beauty of the biotic community. Wrong when it tends otherwise.” And that well-known thought of Leopold’s that has governed many conservationists and environmentalists over the past three quarters of a century brings Van Horn to contemplating an “urban land ethic,” one that will engender this: “New patterns of thought about the purpose and possibilities of a city [that] can create new corridors of life in the urban landscape. Imaginative leaps across neural bridges may build the bridges between our lives and those of other creatures, and may compel us to demand corridors that repair the frayed weave of life giving pathways throughout. Rewilding the mind can rewild our cities.” It is right that his final chapter before his last words in the “Epilogue: Postscript to Hope” is titled “Mindways.” His book, after all is a mind journey inspired by the way of the coyote, trickster and capable thinker who has learned to adapt in the wilds of human constructions. It is difficult to predict a classic. But certainly Van Horn’s book will be read by new generations of those gaining an appreciation of urban wildlife and, indeed, an ethical concern for all living things. While Van Horn relies upon many historical sources, he capsulizes an argument in this journey, this way of the Coyote, that cannot be ignored nor easily forgotten. I expect it will become a classroom staple at the very least, and an exemplary model of nature writing and a thought-provoking discussion of how we might achieve what to some may now seem impossible. Read an excerpt from The Way of Coyote in Emergence Magazine.